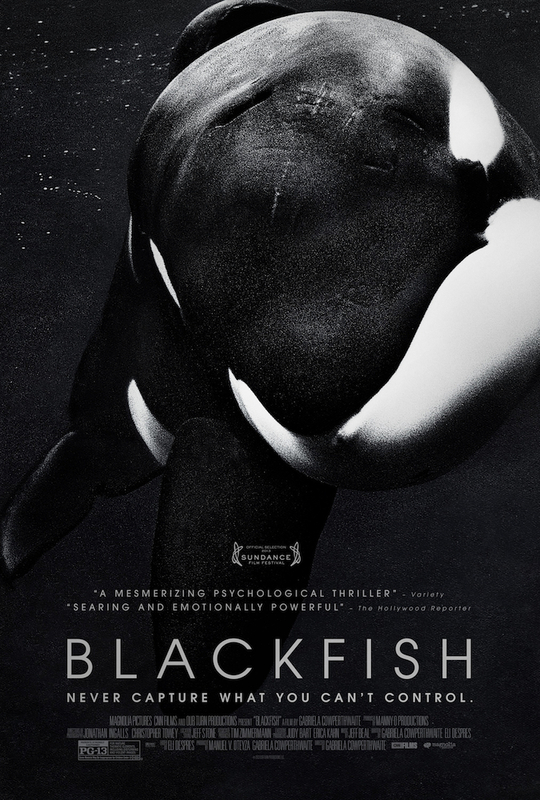 The documentary Blackfish examines the ethical practices of marine parks, specifically Sea World in the wake of the controversial 2010 death of trainer Dawn Brancheau at the hands of Tilikum the killer whale. Heartbreaking for animal lovers and eye-opening for the animal cruelty clueless, first-time feature director Gabriela Cowperthwaite certainly doesn’t pull any punches when it comes to this scathing critique of the industry. 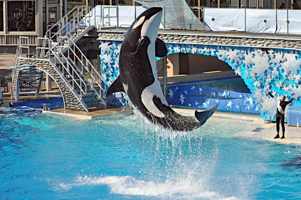 Cowperthwaite, accompanied by former Sea World trainer John Hargrove, recently sat down with Cinedelphia to discuss the film, which opens at the Ritz Five on Friday, July 26. CINEDELPHIA: How did you first discover Tilikum’s story? GABRIELA COWPERTHWAITE: It was through televised media and articles in the newspaper, finding out that Dawn Brancheau was killed was my entry into the story, I didn’t understand how that could have happened. I didn’t know that killer whales did that to human beings, especially killer whales at Sea World. So I came in with that question. Eventually I stumbled upon Tim Zimmerman’s “The Killer In the Pool” article in Outside Magazine, it was a comprehensive take on how killer whales came to be in marine parks in the first place. So for me it was kind of a slow baby step educational process that led to the film. C: And what was unique about this particular story? The media gives us countless reports of horrible incidents on a daily basis. GC: I knew that they were highly intelligent animals so I couldn’t let go of the question of why Tilikum would have made that decision, I wanted to know what was going on inside of his head. In addition to that, while I was trying to figure out what was going on with him, I was hearing that Dawn Brancheau slipped and fell into the pool and then I heard that it was her ponytail being grabbed so none of the information was adding up. So I just figured that if I had this many questions then so does everyone else. C: Were those shared questions in the media at that time? GC: I don’t remember, I don’t know, but I knew that the answers coming from Sea World seemed inadequate and they seemed to be contradicting the information that we may have heard a week before that. I’m a documentary filmmaker so it’s the world of the curious, we’re always asking questions about everything. I’m also a mother who took her kids to Sea World. I thought that place was squeaky clean, ultimately a happy place. I always tell people that instinctively I felt the place was strange, that the show was over the top, you’re hit with so much stimuli when you’re there, music and bright colors and these magnificent beasts doing crazy things so you tend to be anesthetized. So it felt a little creepy and seemed like there was something undignified about jumping off the nose of an animal. So there was a little bit of a cringe factor, but then I looked around the park and everyone was smiling so I figured I just needed to let go of my instincts and embrace the experience. C: I remember that it was stated in the film that Sea World makes over a billion dollars a year. C: I hope the staff is paid well in that case. JOHN HARGROVE: No, even as experienced trainers. The animal field in general is a low paying field across the board. 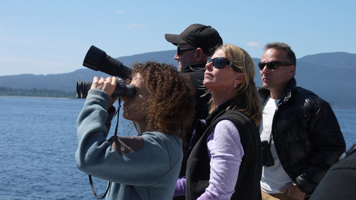 They say that killer whale trainers are the highest paid in the world, what they do is pay us a buck or two more than a competing zoo or whatever and then they can argue that. After Ken Peters was dragged down in the water in ‘06 the topic of money came up and they increased our wages by $5 an hour. So they equated what happened to Ken and the risks that we take for our job with an increase in $5 an hour. And everyone was happy with that because we were so brainwashed at the time. We’re swimming with the most dangerous whales in the corporation and that’s the amount they equate it to. C: I would imagine that you and your fellow employees must have spoken about these things after hours all of the time. JH: That’s the interesting psychology about it. We would complain, but we were so fiercely programmed to defend what we were doing. So if anyone from the public questioned whether it was right to keep these whales in captivity we would come at them defending it pretty aggressively when just a few hours ago we may have been complaining about the very same thing. It just goes to show you how programmed we were in that environment. GC: It’s kinda like how you’re allowed to talk smack about your family members, but no one else is allowed to do so. JH: I’ve gotten hate mail from trainers since I started speaking out, it’s because you’re taking that personally. You feel like if someone says that they feel bad for the whales then they’re inferring that you don’t care about the whales. And we do love those whales and want the best life for them. You feel personally attacked when someone is questioning your love for them. C: So what are the motivations behind those trainers that attack you? Is it a matter of job security or are they just “programmed” as you put it? JH: It’s both. I was driven my job security, I’d been doing that my entire life, what would I do if I left whale training? A lot of it is programming, the brainwashing, it’s hard to escape it, it’s very effective and goes back a lot of years. C: What is it exactly, training videos? Manuals? GC: Some people say that they’re grabbing you in your twenties when it’s your first job out of college and you’re vulnerable. 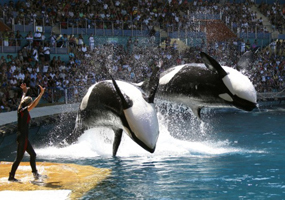 This is your first job and you’re working towards this amazing position in Shamu Stadium. It becomes your world and you don’t want to leave or quit because people are always afraid that their first job might be their last job. It’s a shaping time. JH: It’s really true. I’d been wanting to do this since I was six years old, I grew up with this as my dream. So when I achieved it at age 20 it was everything to me. Once you get there you’re not going to just toss it in the trash because you see one or two things you don’t agree with. For me it was so many things that built up and then that climaxed with the deaths. C: Are you still friendly with anyone that works at Sea World? JH: I have a few very close friends, but lost more people than I kept. Some people have been told directly by management to not speak to me, it’s difficult. Even though they haven’t abandoned our friendship, it’s strained, we went from talking everyday to talking once every few weeks. C: Was it difficult tracking down the film’s subjects and were there any that required a bit of convincing to get them to participate? GC: Yeah, in terms of the former Sea World trainers, some of them had become vocal after the Dawn incident, they’d had enough distance from Sea World that they felt comfortable reflecting honestly on their experience there. It was tougher to get people who had left there more recently. I think they felt like they were still living under the shadow of their employer, a very powerful employer, so it takes them a while to distance themselve from that world. C: Did you approach current Sea World employees for interviews? GC: I did and eventually heard the official statement that Sea World declined to be interviewed. C: Was that a surprise? GC: Well I was very naïve going into this, I had never done a movie about any of these issues. I would have given them a fair voice in the film and listened to what they had to say, so I always thought they were going to say yes. C: In a way, their refusal legitimizes the film’s points that much more. GC: Does it? In all fairness, it would have been very hard for them to be in this film. I would have asked them about the incidents, they knew I was going to tackle it head on and knew that I had interviewed a lot of their critics, I was very honest. So at that point what can they do? I kind of understand their decision. C: I’m picturing the higher ups at Sea World to be uncaring oil baron types. JH: They’re not animal people, they’re just corporate people. The CEO, the general manager, none of those people are animal people. C: Were you at all worried about repercussions, maybe Sea World coming after you? GC: Yeah. Maybe ten years ago I fashioned myself as someone who could stick it to the man and now I think I have a lot to lose, I have kids, Sea World could drain my bank account. I have a husband, a mortgage, you realize that there is a lot at stake and you have to be confident in your document. So I made sure that this was truthful and fact driven. What gives me confidence is that I’m armed with the truth. But does it keep me up at night? Of course it does. C: Did you wonder if there were Sea World representatives in the audience at the film’s Sundance premiere? GC: They did come, from what we hear. Sea World were present and we think that their legal team was there, they asked a few questions during the Q&A. So we know that they’re out there, but if they can brush a colleague’s death aside then maybe this is just another thing they can brush aside. They’ve got a track record of surviving. Blackfish opens at the Ritz Five on Friday, July 26.